The Bigger Picture Blog will endeavour to keep you up to date with the big issues in agriculture, specifically relating to IFM and sustainable agriculture and reports on meeting with government bodies. The James Hutton Institute is a LEAF Innovation Centre that is committed to promoting and developing Integrated Farm Management at their sites in Scotland. 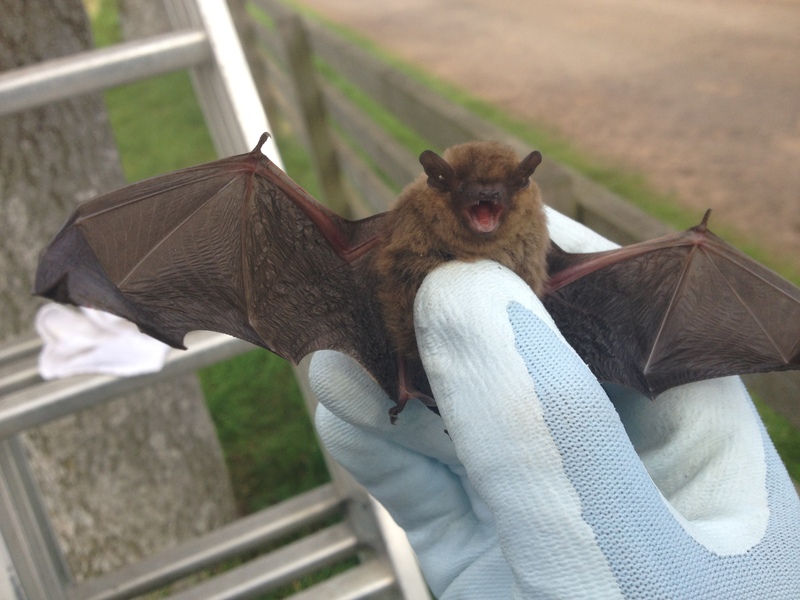 Euan Caldwell is Head of Farms, Field and Glasshouse Facilities and here he tells us a bit more about the bats and owls that have taken up residence at the Balruddery Site near Perth. Here at Balruddery we installed a number of bat boxes in 2009 as mitigation for the lost bat roosts in the old byre (the old stone steading at Balruddery was knocked down in 2009). Originally 20 boxes were installed – 5 each of four types. We lost one last winter when it was blown down and destroyed. Last year we moved three boxes to the gully near Balruddery Den – these were ones which had never been used in their original locations. 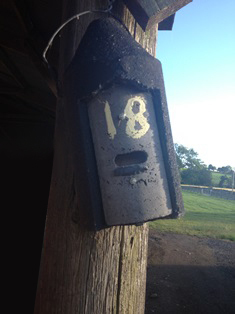 The bat boxes are checked twice annually by David Dodd from David Dodds Associated who is licensed to do so. David checks the boxes to try to identify droppings to establish whether the boxes are in use and clear them of any debris: droppings, old birds’ nests etc. so that the boxes remain usable. To date we have found both Common and Soprano Pipistrelle bats in the boxes. The byre was also used by a shyer species: Natterer’s Bats and I’m hopeful they may move into the boxes eventually. The boxes are usually used through the summer by individual male bats, waiting for the autumn breeding season. The females spend the summer in large maternity groups, rearing their young. In the autumn the males set up territories around small roosts and call females, gathering a “harem” of females. We often find these groups in the boxes in autumn. Last autumn there was evidence of a lot of activity in one of the boxes and David suggested it may have been used as a maternity roost, though it’s hard to be sure. The Tawny Owl is one of bats’ main predators and is capable of taking one in flight in complete darkness. We have had Tawny Owls nesting for the last three years at Balruddery Farm in a nest box we put up ourselves on the eastern fringes of the farm. In years one and two there were two owlets and it was very entertaining to watch them “branch” at dusk, a term used to describe their early attempts at using their wings (jumping from branch to branch) and being fed by the adults who could be seen roosting in a nearby tree during the day. 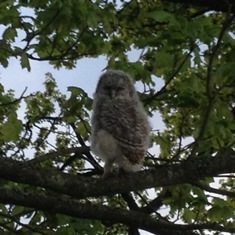 This year there was only one owlet who was particularly adventurous! Our Owls are very entertaining to watch but their presence is also a healthy sign that the habitats we have helped to create, our hedge rows, field margins and beetle banks are sustaining a healthy and productive food chain that enables a top predator like a Tawny Owl to make its home at Balruddery. In this post, LEAF Chairman, Stephen Fell, shares his views on farming and public health following a recent Green City Conference. Part of my own farming business is growing turf, wildflower turf and vegetation mats for green roofs. I have long had an interest in greening urban spaces and have developed a range of products to make that possible. We as farmers who take green space for granted, perhaps forget that over 90% of our population live in urban areas and don’t have ready access to healthy places. I recently attended a Green City Conference where delegates from around the world debated the benefits of urban green spaces and the issues surrounding the implementation of green infrastructure plans. What was really interesting was the synergy of thought between what we do in LEAF, in particular through the Let Nature Feed Your Senses programme, and those in the medical and landscape professions speaking at the conference. Sir Richard Thompson, physician to HM the Queen, concentrated on the health benefits of green spaces. Green gardens in hospitals improve the mood of patients and staff alike “There is a gym outside your window!”. He went through much of the well documented evidence that recovery times are faster and that physical and mental well being is significantly enhanced by access to green, living landscapes. There are huge savings to be made to the NHS budget and architects and builders of hospitals must be made aware of the green benefits. This chimed absolutely with the paper given at LEAF’s recent President’s Event by Gregor Henderson, Head of Mental Health and Wellbeing at Public Health England. The Landscape Institute represents professional landscape architects. Dr Val Kirby produced their outstanding document ‘Public Health and Landscape‘. It is well worth reading, remembering that we as farmers are landscape architects on a grand scale. The Institute believes that much greater priority needs to be given to prevention of ill health in public and social care. Their challenge was to answer the question: can landscape help create healthy places? Improve air, water and soil quality, incorporating measures that help us adapt to, and where possible mitigate, climate change. See what I mean? Integrated Farm Management and Let Nature Feed Your Senses. Town and Country, City and Farmland. Our urban cousins are realising what we have long known – that being out in a green landscape is good for you. It’s much more challenging to create and maintain that green space in the middle of a city, but we as the large scale ‘landscape architects’ have a wonderful opportunity to improve the health of the nation. By opening our farms, encouraging disadvantaged or convalescing people to experience, see, feel and smell what we can take for granted is a precious gift – perhaps we should all think more about the links between public health and landscape. Stephen Fell is LEAF’s Chairman and Managing Director of the family farming business HR Fell and Sons Ltd, running a flock of 1000 sheep and growing root crops at Thorganby in the Vale of York. He is also Managing Director of Lindum Turf, a business growing and marketing a range of turf and specialist grass and wildflower products. Next week (it’s come around quickly! ), we will be holding our annual President’s Event in London. As always, the response has been tremendous and we’re now fully booked. However, for the first time this year, you can follow the event live on our website! Commentating on the event live will be LEAF Trustee, Cedric Porter – click here to go to the live event page. The theme of this year’s event is ‘Sustainable Agriculture: Show me the money’. Valuing the outputs of sustainable agriculture is an incredibly difficult task, the public goods farming delivers are vast and often difficult to quantify. This conference will explore the three pillars of sustainability, debate new ideas on how money can be made from each of them and examine LEAF’s role in making this happen. We interviewed LEAF’s Chief Executive, Caroline Drummond about the theme of this year’s event, you can see the video below. Caroline spoke about the increasing demands society is placing on what it expects from agriculture – ranging from a plentiful supply of affordable food, traceability, a thriving environment and access to a well-managed landscape, bringing with it a host of health and wellbeing benefits. She explained that new ways of thinking need to be explored to ensure farmers are able to deliver on all these levels, whilst also looking after their own bottom line. Ultimately, she said, profitability has to lie at the very heart of sustainability. Get involved in the event by tweeting with the hashtag #LPE13 and follow the event live here! To keep up to date with our President’s Event, please subscribe to LEAF’s EBrief here. What a sea change we have seen over recent years in the consuming public’s perception of agriculture. True, the same weary suspects still trot out their mantras about intensive farming ruining the environment, hedgerows ripped out and farmland bird populations reaching dangerous levels, but the reality, I believe, is that many people now have a much greater appreciation of agriculture’s role in producing safe, wholesome food, and that they care about the land that they are custodians of. The horse meat scandal, the effects of atrocious weather with repercussions affecting two harvests, the plight of some farmers in less favoured areas, and the real hardship of farmers coping with bovine TB, have been regular features in the media. More people have taken holidays in the UK this year and have discovered how truly beautiful our countryside is. Here in Yorkshire where I farm, we are spoilt for choice with the unique landscape of the Dales, the purple majesty of the North York Moors, and the rolling splendour of the fertile Wolds. The barren wastes and the ‘silent spring’ don’t seem to exist as the London based left-wing intelligentsia would have us believe. LEAF has played a major part in this, with its role in improving communications and engaging local communities. Over a million people have visited farms during Open Farm Sunday since it started seven years ago. Others visit LEAF Demonstration Farms throughout the year. The NFU has also played a huge role in calmly putting farming’s case in the face of scares and media hysteria. The recent “Harvest” series of three programmes on prime time BBC2 shows how far we have come. 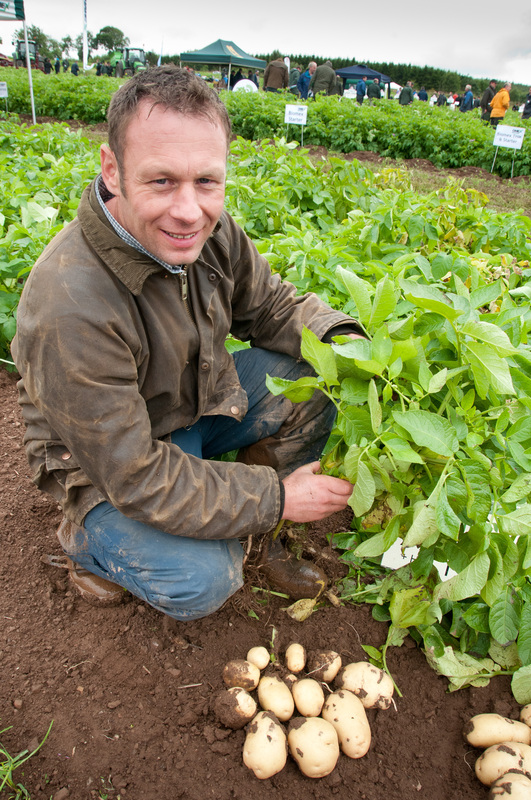 Andrew Burgess, a LEAF trustee and LEAF Marque producer demonstrated in a most genuine way his passion for growing a range of wholesome vegetables to the highest standard, on a large scale to high environmental standards. What was noticeable was that the presenters were so enthusiastic about this modern, technology driven harvest, and there was no carping about industrial farming and reliance on poisonous pesticides and fertilisers. Andrew, and his fellow farmers on subsequent nights, have made us a lot of friends out there. This morning, UK Environment Secretary Owen Paterson, gave a keynote speech on the subject of GM (Genetic Modification) at Rothamsted Research in Harpenden, Hertfordshire. Mr Paterson said, “GM has already been used to make crops that can resist attack from specific insect pests or plant diseases. 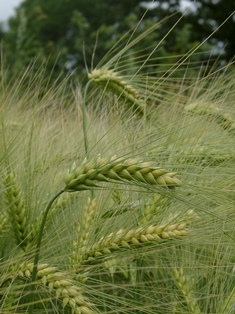 Other traits are being developed, including using scientific expertise here in the UK. At LEAF, we recognise the importance of innovation and technology, including modern biotechnology and developments such as GMOs (Genetically Modified Organisms). The potential benefits to farmers and consumers need to be clearly identified and weighed against the possible risks. Risk management is paramount to the decisions being made and as the jury is still out; LEAF will continue to monitor developments. However, there are several areas that cannot be neglected. One of these is the need for more research into GM technology. We need to be able to establish the development of plants that have greater resistance to pests and diseases, more resilience to adverse environments and develop the nutrition value of crops. Added to this is the importance of beneficial husbandry practices and Integrated Farm Management. Rotations, safe use of inputs, cultivation choice, variety choice, good record keeping and management systems such as those advocated by LEAF are essential. GM will never be an alternative to these practices, it has the potential to be one of the tools in the box. There is a need for rational debate on GM, bringing together researchers, farmers and consumers. At our annual President’s Event in 2011, we brought together Prof Sir David Baulcombe, FRS and Andrew Burgess, Agricultural Director of Produce World, to openly discuss plant genetics and opportunities in agriculture. You can see this discussion in the video below. Our full position on GMO’s can be found on our website here. What are your thoughts on GM technology? What are the big questions yet to be answered? Please give us your views in the comments section below. So three neonicotinoid products are to be banned across Europe for two years from December 1st 2013. It is evident that there are a range of possible reasons for a decline in bee populations, including diseases such as Varroa, issues surrounding breeding and sufficient food and habitat availability. In two years’ time there will be a review of the ban, but is that long enough to prove anything? I think we’ll just have to wait and see. There are some interesting views on the topic here. One thing the whole debate has stirred up is the need to do more for bees and other pollinators, and it has given much needed publicity to the importance of bees in the environment. Through some good woodland management, with coppicing and maintaining the flora, there is also a thriving wild bee population in the woodland found on the farm. Andrew has been recording the fauna and flora on the farm through photography on its own dedicated website. “Ultimately, I am interested in monitoring population changes from one year to the next. But what it’s really doing is making me much more aware of the species we do have on the farm”. I urge you to take a look – it’s great to see the diversity of wildlife and there are some cracking photos too, my favourites being the hare shots! Perhaps we hear about this kind of wonderful work disproportionately at LEAF, because of the nature of our members. At LEAF, we promote Integrated Farm Management, which is an approach delivering sustainable farming. One part of this is landscape and nature conservation, which sits alongside other areas like crop health and protection. The point is that everything needs to be integrated on the farm, and lots of our members have that approach. Bees are vital to farming. Integrating positive steps to provide food and habitat for pollinators into commercial farming is something we fully endorse. What do you think of the neonicotiniod ban? Is there more we can do for pollinating insects or do you think we’re doing enough already? I’d like to hear your views – please comment below. LEDs: Lighting the future of sustainable horticulture? For many years High Pressure Sodium (HPS) lamps have been the horticultural industry standard for lighting glasshouse production. However, there has been steady growth in the uptake of LED lighting systems, with many growers now investigating the new opportunities they present. One application of LED lighting is being investigated by researchers at Stockbridge Technology Centre (STC), a LEAF Innovation Centre in North Yorkshire, UK. They have been looking at moving horticulture units into highly insulated enclosed warehouses lit by LED lighting systems, often called Urban Farms. The benefits of production in this way all relate to control – control of the temperature, lighting, water and even to some extent, control of pests and pathogens due to the closed system. Large savings can be made in heating costs in heavily insulated buildings, compared to glasshouses, and these savings are expected to outweigh lighting costs, especially as each decade LED prices have fallen by a factor of 10 while performance has grown by a factor of 20 (this phenomenon is known as Haitz’ Law). A current problem with LED lighting systems is the cost of the installation, although this is expected to fall in the coming years. With energy savings of 48%, Patrick thinks it could still be several years before an investment would start to pay off. There are benefits aside from the financial ones, however. Light pollution is a major issue in planning permission and with local complaints. LED lighting is more directional, which means there will be less light spillage. Although this hasn’t been proved on a commercial scale, in theory it makes perfect sense. Of course, any light spillage means that light is not getting to the plants and is lost, so being more targeted could have benefits in efficiency too. with Philips Greenpower LED lights. There are three colours of light (red, blue and far red) which efficiently drive photosynthesis and stimulate the plant to control morphology and flowering time. LEDs used for horticultural applications emit these colours, but the amount of each colour and how many hours the lights operate can be varied according to ‘light recipes’. Specific recipes for different crops are being identified in research at STC. Work already carried out in the facility has shown that plant morphology can be greatly altered by changing the ‘light recipe’. However, controlling the ‘light recipe’ in an open glasshouse environment will need more work. In Patrick’s trials they achieved almost the same results using three different ‘light recipes’. If you’re thinking of making the transition to LEDs in existing glasshouses or to Urban Farming systems, Stockbridge Technology Centre will provide UK growers with the expertise and knowledge needed to assess the potential benefits, contact Phillip Davis for more details. What do you think? Do LEDs represent the future for sustainable horticulture? Let us know in the comments section below. With thanks to Patrick Bastow and Stockbridge Technology Centre. This post also features on the 2degrees network here. 2degrees is the world’s leading community for sustainable business. “You can’t manage what you don’t measure” goes the old management adage. Over the 21 years of LEAF’s existence we’ve gathered a lot of data on farming practices. We’re now taking the next step towards effective measuring of sustainable farming, with our initial results in our new report ‘LEAF – Driving Sustainability’ (launched 19th March 2013). Much of the data in the report was from the LEAF Audit. This is one of the tools we offer our farming members. It is a self-assessment farm management tool, which helps farmers take a look at their farm and guides them towards more sustainable practices. The flip side of this is that we can then use this information to monitor trends and assess the progress of our members towards delivering more sustainable agriculture. We developed 24 objectives for sustainable farming and scored progress towards the objectives using data submitted by LEAF Audit users. Doing this has allowed us to spot trends over time and to assess performance under each of the three pillars of sustainability – economic performance, environmental quality and social health. We found that farmers who complete the LEAF Audit have an impressive average sustainability index rating of 2.50 out of 3, indicating that the majority of LEAF Audit users’ businesses are economically, environmentally and socially robust. LEAF farmers are strongest when it comes to Environmental Quality with an average score of 2.57, followed closely by Economic Performance at 2.53 and Social Health at 2.13. Although Social Health, which includes engagement with the community, has a lower rating, it is in this area that the greatest gains have been made over the last three years. We wanted to have a few simple indicators and we’ve ended with 24 objectives, which could be simplified. I think this is quite indicative of a first attempt but we’re not hiding from that, we’ve put it out there for the industry and we want your views. The report is available to download here. Please feel free to share your views with us as comments here, on twitter or via email.